So ends “The Layers’’ by former US poet laureate Stanley Kunitz, one of the poems read aloud Monday night by more than a dozen local celebrities, writers, executives, and civic leaders as part of Mass Poetry’s annual “Evening of Inspired Leaders” fund-raiser at the Huntington Theatre. “I am a human person first. I am a Bostonian. 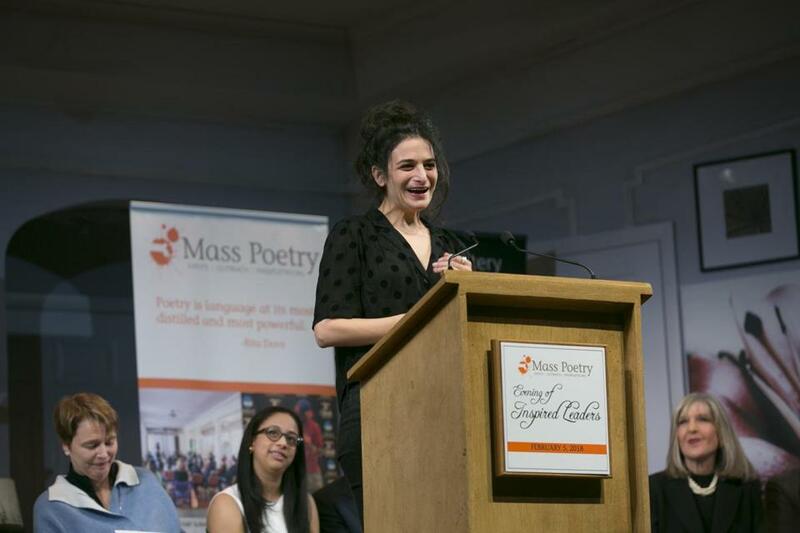 And I am out of my element,” actress and Milton native Jenny Slate confessed before reading the Kunitz piece, which she said is a work that gives her both hope and pleasure. Slate, whose poet father, Ron, also participated, essentially described the night’s theme: poems that each reader found personally meaningful. Many of the readers chose poems that responded in some way to the nation’s tumultuous political climate. Former United Nations ambassador and author Samantha Power shared “A Song on the End of the World” by Nobel winner Czeslaw Milosz, which was written in 1944 in Warsaw during the Nazi occupation. “This is a poem that I never thought would resonate here,” Power said. State Attorney General Maura Healey read “The New Colossus,” written by Emma Lazarus to raise funds for the Statue of Liberty monument; Boston Public Schools Superintendent Tommy Chang offered “Let America Be America Again” by Langston Hughes; and City Councilor-at-Large and congressional candidate Ayanna Pressley presented “Revolutionary Dreams” by Nikki Giovanni. Cambridge novelist Celeste Ng read Ellen Bass’s “Any Common Desolation” and shared that she has found herself turning to poetry for solace and inspiration. The educational nonprofit’s event was emceed by Meghna Chakrabarti of WBUR.